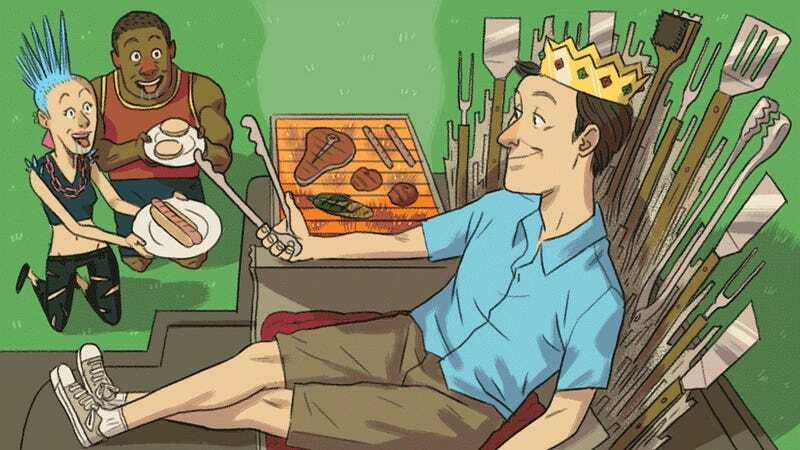 If a backyard is the modern homeowner’s kingdom, then the barbecue is the seat of your power. There’s no feeling more glorious than the one you get while standing in front of your grill, spatula in one hand, Coors Banquet in the other, staring at a sizzling hunk of burger. What’s that? You don’t know how to grill? Read on to get the char of your dreams while barely lifting a spatula. First things first: acquire a grill. Are you deciding between a charcoal or a gas grill? Of course you aren’t — you should always go for charcoal. While they may be harder to heat up, they’re easier to assemble and will usually cost less. More importantly, they give the meat a better, smokier flavor. Assuming you decide to go with a charcoal grill, get a chimney starter to help you light the charcoal itself. If you don’t really care about the journey but the destination, a gas grill admittedly has some benefits. It’s easier to light and takes less time to heat up to cooking temperature. Pro Tip: You can also use an egg carton to get that fire started. Put it in the middle of the grill, put charcoal in the holes, and light it up. Once you’ve decided on the grill, it’s time to get that thing going. Keep the grill oiled using a paper towel soaked in oil. Now you’re ready to heat it up. You’ll generally want to go with the specific heat setting that’s best for what you’re cooking. But if you’re just doing your standard burger/hot dog combo, you don’t have to overthink it — just go with a fire that’s hot. Now that you’ve got the grill all hot and bothered, it’s time to introduce it to some succulent meats. Hosting vegetarians? Don’t worry — the magic of grilling is that you can do it to just about anything. There’s nothing that unites your weird vegan/raw-foods-only friend and your fitness-mad protein-shake-drinking brother-in-law quite like a good grill. Like hot dogs? Of course you do. Forget heating your mouthwatering meat tube up on the stove. Instead, just take any old garbage grocery store weenie, plop it on the grill, and it’s practically gourmet. Want some steak? Everyone wants some steak. Throw one on the grill and you’ll never go back to searing the damn thing again. And while vegetables are only okay, on the grill they taste a ton better. Head here for a comprehensive guide on what to grill and how to grill it. And remember to clean everything up. No one wants their beautiful slice of burger covered in burned meat drippings from last Memorial Day. The best solution is to scrape off any residue with a wire brush while the grate is still hot. You can also just use an onion and a fork. Pro Tip: Line up your food in the order you put it on the grill. That way you’ll never forget what to flip and what to remove. While undeniable classics, grilled supermarket burgers and hot dogs tend to be run-of-the-mill at barbecues. And even if you’re a run-of-the-mill kind of guy, grilling beyond the standard bun-meat-cheese combination is easily doable. Brisket’s a good choice and worth the effort. Did you listen about the superiority of the charcoal grill? Good. Now you can cook a caveman steak. Cooked directly on the coals, this steak is the easiest and most delicious one to grace your mouth hole. It’s what your ancestors probably did, flinging their mastodon ribs directly on top of burning coals and the flesh of their deceased pet woolly mammoth. But remember, only use natural chunk charcoal and not briquettes if this is your method of choice. And don’t limit yourself to traditional barbecue foods. While a grilled pizza might anger some pizza purists, you can’t let that hold you back. Its perfect mixture of crispy crust and gooey cheese is basically what we were put on Earth for. Don’t forget sandwiches, either. A nice char turns your average bread/meat/melty-cheese concoction into something extraordinary. Whatever you cook, don’t hold back. The number one rule of grilling is that anything goes. Learn it, love it, and soon, you will be able to rule the summer backyard scene. Because nothing tastes bad when it’s hot off the grill, and there’s just something about that heavy smoked fragrance that sticks to your skin and your hair. So now that you’ve got your barbecue best practices down, it’s time to grab a Coors Banquet beer and char up some meats to perfection.